"Soukous will be danced everywhere," Abeti Masikini declared in a 1991 interview. "It's going to be a movement like rock....If God still gives us life." At the time, just short of her 37th birthday, she dearly wanted to be a central force for making it happen. "Tina Turner gives me hope," she said referring to the career rebirth Turner experienced in her mid-forties. Abeti seemed forceful, almost driven, intent on making her career even more successful than it already was. Cancer deprived her of the opportunity. Abeti died in the early morning hours of September 29th at the Paul Brousse Hospital, a well-known cancer treatment center in Villejuif south of Paris. According to a spokesman for AMG Productions, the Paris-based entertainment company owned by Abeti and her husband-manager, Gérard Akueson, the singer had entered the hospital five days earlier. She had been convalescing at home after a previous hospitalization when her worsening condition forced her to return. Her body was flown home to Zaïre for burial in early October. In addition to her husband, she leaves three children and thousands of fans around the world. Growing up in Zaïre, she always felt strangely different from other people, a condition that perhaps enabled her to defy parental proscriptions and break through the barriers of Zaïre's male-dominated music industry. Women have a difficult time getting into the business because of her country's customs and traditions, she explained in 1991. "The morals don't accept it. For [Zaïreans], women cook and have babies. That's it. For women especially, music is a disaster, because it's [considered] a bad life." Abeti's success built on the pioneering work of earlier woman singers, Lucie Eyenga and Antoinette Etisomba, and helped open the doors for M'bilia Bel, Tshala Muana, M'pongo Love, and other women who would follow her to prominence. Abeti was born on November 9, 1954 (although as late as 1977 the Zaïrean press gave 1951 as the year) in Kisangani, the former Stanleyville in northeastern Zaïre. She moved with her family to Kinshasa around 1960 where she began to follow her musical muse in earnest. She disliked discussing her early life because of the "bad memories" it evoked. She spoke obliquely of her father's involvement in politics around the time of Zaïre's independence, a situation that made the family home a target for violence and forced her parents to send the children to boarding school. Her father died soon after their arrival in Kinshasa, and her mother followed him in death three or four years later. Abeti called herself an orphan, raised by an extended family of relatives and schoolmasters. She learned to play organ and piano in church and at school and sang lustily on every possible occasion. As a teenager she began to enter singing competitions despite her family's disapproval and gender discrimination on the part of contest organizers. In 1970, she took third place in a festival put together by Zaïrean singing star Madiata Madia (Gérard). Her performance impressed Togolese promoter Gérard Akueson who was in the audience looking for new talent. Akueson had guided Togolese singer Bella Bellow to stardom, and he felt Abeti had potential. With grudging consent from Abeti's guardians, Akueson took her to Lomé where she learned to control her powerful voice and developed her compositions and choreography into a professional revue. Together with other artists in Akueson's stable, she hit the road in 1971 and 1972 for performances throughout West Africa where audiences received her with great enthusiasm. It was like the shakedown tour before an opening on Broadway. Abeti hit the big-time in 1973. Akueson used the connections he had built up during a long residence in France in the sixties to secure a booking for Abeti at the famed Paris Olympia concert hall. Backed by a Zaïrean band, Les Ecureuils (the squirrels) and her younger brother, Abumba, on guitar, Abeti took the Olympia stage on February 19, 1973. "I was really afraid, that's what I remember," she said in 1991. "[I thought] they will never accept me." But the audience greeted her warmly, and her nervousness yielded to the confidence nurtured by the previous two years of touring. 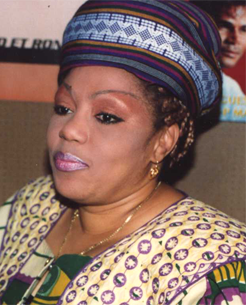 Akueson recalled that the newspaper France Soir called her a "tigress" and "l'idole du Zaïre" (idol of Zaïre), accolades that stuck with her the rest of her life. The concert, Abeti said, "gave me my [musical] identity card. Success at the Olympia brought an offer to record from French fashion designer Pierre Cardin, who was launching his own music label. The collaboration resulted in Abeti's first record, an LP entitled simply Abeti. Still largely unknown at home, Abeti returned to Zaïre for a triumphal concert at Kinshasa's own "Olympia," the Palladium cinema hall. Her compatriots, the Zaïrean press, and especially her once disapproving family, now welcomed her with acclaim. In March of 1974, Abeti brought her act to the home of Louis Armstrong, Benny Goodman, Maria Callas, and a host of other international stars, New York City's Carnegie Hall. For a young African woman, barely out of her teens, it was an extraordinary achievement. Akueson's American collaborator had booked an extensive U.S. tour of clubs and universities, and a Miriam Makeba-sized break into the U.S. market seemed within reach. But Zaïrean politicians torpedoed the tour by insisting that Abeti fly to Europe to entertain at a diplomatic function where President Mobutu was to speak. Under the threat of dire consequences should she disobey, Abeti canceled all her U.S. engagements only to find out, too late to recover, that Mobutu's appearance had also been scuttled. Back home in Zaïre, she entertained around the country and began releasing singles on the Kinshasa-based Aziza label. Akueson compiled her singles into albums for international release on his Bade Stars Music label. She began to call her dancers Tigresses, her band Les Redoutables. She returned to the Paris Olympia in 1975, playing two highly-praised dates in April. Two young hopefuls who would later become stars in their own right, M'bilia Bel and Tshala Muana, joined her Tigresses. She married Akueson and took time out to have babies. "I never feel tired," she once told Zaïre magazine. "On the other hand, inactivity weighs to such an extent that I feel like an old paralytic when I have nothing to do." Abeti sang in Lingala, Swahili, and French and wrote most of her own music. Sometimes a melody would just come, often when some one offended her "self-love, her dignity." She hated the oppression of women and felt compelled to respond through her music to injustices she encountered. "Je Suis Faché," she sang in one of her last albums, I am angry. When composing Abeti liked to sing into a cassette, then turn it over to one of her musicians to work out the arrangements. She thought of herself as a modernizer who added synthesizer to the instrumental mix and speeded the rumba into soukous, all the while trying to keep in touch with her traditional roots. "You have to be modern," she said. "People talk about authenticity, but we are driving around in cars, flying in planes. We have to be realistic....[But] you can't take our African soul away." In the same way she developed her public persona. Abeti was a short and increasingly stout woman, heavily made up with most of her eyebrows plucked and new ones painted on in great sweeping arches higher up on her forehead. Her skin was a light, creamy color, which she clothed from an assortment of gorgeous African gowns and billowing head ties. She looked every inch the star that she was. In the 1980s Abeti and Akueson joined the swelling numbers of Zaïrean artists migrating to Paris. As conditions at home deteriorated and the international market opened a crack, a European base made good business sense. But for Abeti, residence in Paris was always temporary. Kinshasa, she insisted, was really her home. Compared to its promising start, Abeti's career seemed to flounder in the last few years. She continued to release albums at the pace of about one per year and kept up a busy schedule of live performances, but the promise of the seventies never quite developed. The English language press seemed to ignore her almost entirely. Pop music guides like Penguin and Guiness failed to record an Abeti entry. Highlights of the decade included concerts in China and a short tour of West Africa with the great guitarist Docteur Nico shortly before his death in 1985. She recorded her most recent release, La Reine du Soukous, the queen of soukous, in 1991 for producer Jimmy Houetinou. Abeti joins the alarmingly long list of Zaïrean musicians who have died at much too young an age. The queen of soukous has gone home for good. This article first appeared in The Beat, vol. 13, no. 6, 1994.